Royalet Electronic Bidets introduces a new level of comfort, luxury and personal hygiene. 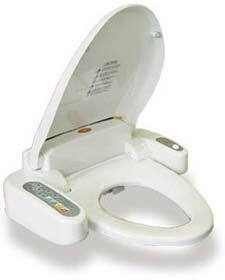 The Royalet’s elegant stylish design will complement any bathroom and simply replaces your existing toilet seat. The Royalet comes with a range of convenient features designed to leave you feeling fresher and healthier all day long. The features include a two nozzle system for his and hers, an adjustable nozzle position, adjustable water temperature, adjustable water pressure, massage feature, anti-microbial seat, heated seat with adjustable temperature, self cleaning nozzle, pressure activated seat, hydraulic "anti-slam" lid & seat, warm air drying with adjustable air temperature, deodorizer, wash & dry one touch button function and a power save function. It even has an automatic lower seat and lid. For decades other cultures around the world have looked to bidets for cleansing because water is more comfortable, more effective, and above all, more hygienic than tissue. So for information on this practical, hygienic, inexpensive and easy to install product, give Royalet a call or get onto their website.